One of our favorite Disney movies is The Jungle Book. My children love the story, as well as the music. One of Emily’s favorite songs to perform for us is Bare Necessities, which is also one of my children’s favorite parts of the movie. We decided in the spirit of Baloo teaching Mowgli about the fruits of the jungle, as well as how delicious he believes ants are, we would create a fruit salad. The ingredients listed below happen to my children’s favorite fruits, but they can be easily adjusted to your child’s favorites. 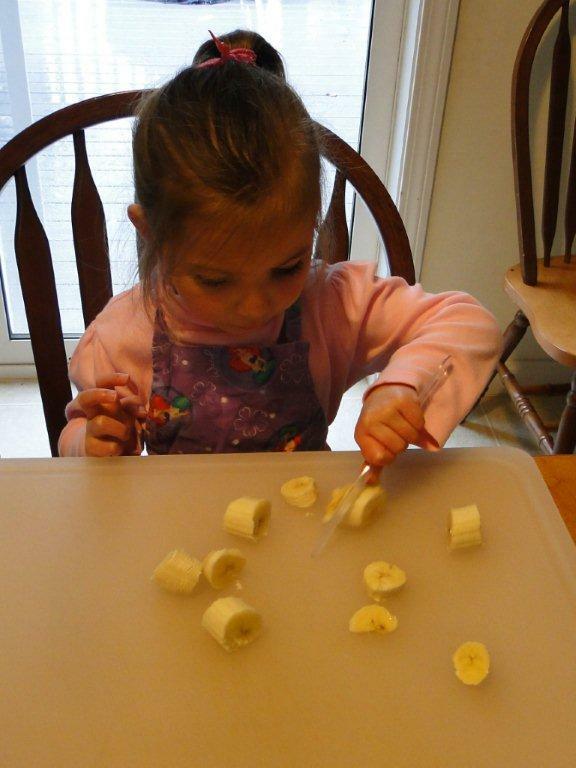 Also, depending on your child’s age, this is a great recipe to teach your children how to use a knife. I gave my girls, ages 3 and 4, each their own plastic knife. Note: Because the bananas can turn brown very quickly, we only make enough to eat in a sitting. If you wanted to make it ahead of time, you could cut up and mix all the fruits except the banana. Then, when you were ready to serve it, cut up and add the banana. Have your child use the plastic knife to cut the stem from the top of the strawberries. Have her hold the opposite end of the strawberry firmly, then use the knife to slice through it. Stand the strawberry on the stem side (which is now flat) and have her use the knife to cut the strawberry into bite sized pieces. Place all the fruit into a bowl and mix. 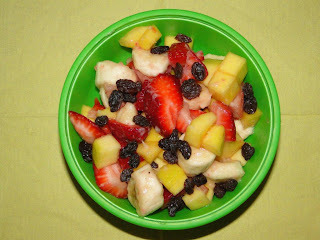 Divide the fruit salad between four dishes. Sprinkle the raisins over the top. If you have older children, you could have them put the fruit on skewers, just like Baloo collects the fruit on his claw. 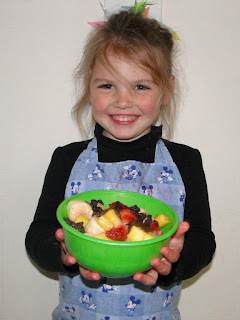 This is a quick and healthy snack that I can involve my children in when creating. Even better, both my girls were so proud of themselves for cutting the fruit with the knife on their own, they even called Grammie and Grandpa to tell them. Now they are already asking what we are creating next! Sounds yummy. And your girls are so cute.. Thank you! Hayley and Emily love to cook. My mom has made them a whole bunch of Disney aprons with their favorite characters. Choosing the apron has become as much a part of the process as the actual "cooking." :-) We've made this fruit salad three times in three days. They love making it and love eating it! Great pics! Looking forward to trying this dish. Looks delicious right up our alley! Thank you!